Aganetha Dyck gets a lot of help creating her artwork. But rather than employ studio assistants or take on interns, the artist collaborates with hundreds of bees. Dyck, who says her main focus is “how knowledge is transported and transcribed between humans and other species”, considers her work to be an equal collaboration with the insects. “My research has included the bee’s use of sound, sight, scent, vibration, and dance. I am studying the bee’s use of the earth’s magnetic fields as well as their use of the pheromones (chemicals) they produce to communicate with one another, with other species and possibly with the foliage they pollinate.” (source) Some of her most striking pieces are small figurines that she places inside hives, to allow the bees to adorn with honeycomb. She also sometimes places drawings or paintings inside hives and lets the bees add texture and color to them. 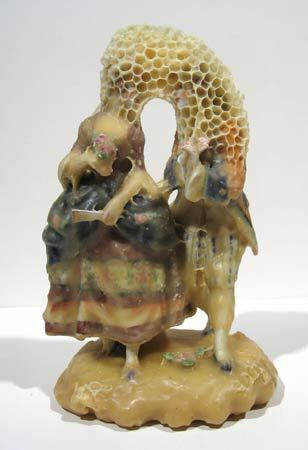 Dyck’s (and the bees’) small sculptures are particularly striking because of their uncanny effect of juxtaposing something highly refined but essentially useless (porcelain figurines of lords and ladies in fancy dress) with something raw, natural and made with a clear purpose (honeycomb). Both parts of the sculpture seem somehow alien, like something found in grandma’s attic on another planet. That quality may be especially appropriate for work made with bees, a crucially-important species whose numbers continue to drop dramatically. This unique artwork may one day be impossible to create if Dyck’s collaborators continue to die off. Dyck’s work is featured in the exhibit “Nature’s Toolbox: Biodiversity, Art and Invention”, which opens at the Ulrich Museum of Art in Wichita, KS next month through December 2013. This entry was posted in The Art of Science, Uncategorized and tagged Aganetha Dyck, bees art, beeswax art, honeycomb art, science art. Bookmark the permalink.